The 1920 Summer Olympics (French: Les Jeux olympiques d'été de 1920; Dutch: Olympische Zomerspelen van de VIIe Olympiade; German: Olympische Sommerspiele 1920), officially known as the Games of the VII Olympiad, were an international multi-sport event in 1920 in Antwerp, Belgium. In March 1912, during the 13th session of the IOC, Belgium's bid to host the 1920 Summer Olympics was made by Baron Édouard de Laveleye, president of the Belgian Olympic Committee and of the Royal Belgian Football Association. No fixed host city was proposed at the time. The 1916 Summer Olympics, to be held in Berlin, capital of the German Empire, were cancelled due to World War I. The aftermath of the war and the Paris Peace Conference, 1919 affected the Olympic Games not only due to new states being created, but also by sanctions against the nations that lost the war and were blamed for starting it. Hungary, Germany, Austria, Bulgaria, and the Ottoman Empire were banned from competing in the Games. Germany did not return to Olympic competition until 1928 and instead hosted a series of games called Deutsche Kampfspiele, starting with the Winter edition of 1922 (which predated the first Winter Olympics). The sailing events were held in Ostend, Belgium, and two in Amsterdam, Netherlands. In March 1912, during the 13th session of the IOC, the bid on the behalf of Belgium to host the 1920 Summer Olympics. It was made by Baron Édouard de Laveleye, president of the Belgian Olympic Committee and of the Royal Belgian Football Association. No fixed host city was proposed at the time. Among the 22 vice-presidents of the committee were people with a military or industrial background, and further people from sports organizations like Paul Havenith, president of the football and athletics club K. Beerschot V.A.C. and Nicolaas Jan Cupérus, president of the Belgian Gymnastics Federation. The first action of the committee was to send an official letter to the IOC in Paris, confirming Antwerp as the city for the Belgian Olympic bid. On 13 September 1913, Pierre de Coubertin, president of the IOC, visited the grounds of the future Olympic Stadion in Beerschot. In 1914, a 109-page brochure was created to promote the idea of Antwerp as a host city for the Olympics: Aurons-nous la VIIème Olympiade à Anvers? (Will we have the 7th Olympiad at Antwerp?). It was sent to all IOC members and was used during the 6th Olympic Congress in Paris in 1914, where the candidacies of Amsterdam, Antwerp, Budapest, and Rome were discussed. Despite a slight preference at the time for Budapest, no final choice was made, and the outbreak of World War I soon afterwards prevented any further progress. In 1915, Lyon made a bid for the 1920 games, but after some discussion, they agreed to support Antwerp and postpone their bid until 1924 if Antwerp was liberated in time to organize the games. The support for Belgium by cousin country France, then the leading country of the IOC, also meant that Amsterdam, and Budapest, in an enemy state, made no chance for the 1920 games against Antwerp. New candidacies from American cities did not have that disadvantage and bids were received from Cleveland, Philadelphia, and Atlanta (which would eventually host the 1996 Summer Olympics), and Cuba also planned a bid for Havana. But shortly after the armistice in November 1918, the IOC decided to give Antwerp the first choice, if they still wanted to host the 1920 Games. In March 1919, the Belgian Olympic Committee decided to go ahead with the organization, and on 5 April 1919, in a meeting in Lausanne, Antwerp was officially declared the host city for the games of the VIIth Olympiad. An executive committee was established on 17 April 1919, with Henri de Baillet-Latour as chairman and Alfred Verdyck, the secretary of the Belgian Union of Football Clubs, as general secretary. Seven commissions were created, to deal with finances, accommodation, press relations, propaganda, schedules, transport, and festivities. Finances and scheduling proved to be the two hardest parts to tackle: the program of events only was published in February 1920, six months before the official start of the Games. Between 23 and 30 April 1920, an ice hockey tournament marked the early start of the Games. Held in the "Palais de Glace" or Ice Palace in Antwerp, it was the first time that ice hockey was an Olympic sport. The first stone of the new Olympic Stadium at Beerschot was laid on 4 July 1919 by Jan De Vos, mayor of Antwerp, and inaugurated less than a year later on 23 May 1920 with a gymnastics demonstration. The nautical stadium or Stade Nautique d'Antwerp was built at the end of the Jan Van Rijswijcklaan, using the city ramparts there as a spectator's stand. Other events, like shooting, boxing, and equestrian sports, were held at pre-existing locations in and around Antwerp and as far away as Ostend. These Olympics were the first in which the Olympic Oath was voiced, the first in which doves were released to symbolize peace, and the first in which the Olympic Flag was flown. The USA won 41 gold, 27 silver, and 27 bronze medals, the most won by any of the 29 nations attending. Sweden, Great Britain, Finland, and Belgium rounded out the five most successful medal-winning nations. The Games also featured a week of winter sports, with figure skating appearing for the first time since the 1908 Olympics, and ice hockey making its Olympic debut. Nedo Nadi won 5 gold medals in the fencing events. At the age of 72, Sweden's 100 metre running deer double-shot event champion Oscar Swahn, who had participated in the 1908 and 1912 Games, came in second in the team event to become the oldest Olympic medal winner ever. 23-year-old Paavo Nurmi won the 10,000 m and 8000 m cross country races, took another gold in team cross country, and a silver in the 5000 m run. His contributions for Finland broke the U.S. dominance record in track and field with 9 medals. Duke Kahanamoku retained the 100 m swimming title he won before the war. In a rather strange moment in Olympic history, the 12-foot dinghy event in sailing took place in two different countries. The final two races in the event were independently held in the Netherlands, on its own accord, supposedly because the only two competitors in the event were Dutch. Sport shooter Guilherme Paraense won Brazil's very first gold medal at the Olympic Games. The United States sent a women's swim team for the first time, having refused during the 1912 Games on the grounds that it was "obscene". The six-woman team produced two gold medals. 156 events in 29 disciplines, comprising 22 sports, were part of the Olympic program in 1920. The Sailing program was open for a total of 16 sailing classes, but actually only 14 sailing events were contested. The number of events in each discipline is noted in parentheses. Seventeen sports venues were used in the 1920 Summer Olympics. This marked the first time that the football tournament was spread throughout the country, which has mostly been the case since. Photograph of the games at Antwerp, Belgium, 1920. 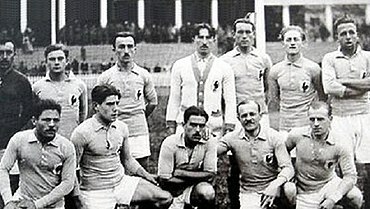 Participants in the 1920 games, with the nations in blue participating for the first time. A total of 29 nations participated in the Antwerp Games, only one more than in 1912, as Germany, Austria, Hungary, Bulgaria and Ottoman Empire were not invited, having lost World War I. From the newly created European states, only Estonia took part, and Czechoslovakia, succeeding Bohemia which had sent athletes prior to World War I as part of the Austrian Empire. Poland was busy with the Polish-Soviet War and therefore was unable to form an Olympic team. Soviet Russia was also not invited as part of its political embargo by the West. Argentina, the Kingdom of Serbs, Croats and Slovenes, Brazil, and Monaco competed as nations at the Olympic Games for the first time. New Zealand, which had competed as part of a combined team with Australia in 1908 and 1912, competed on its own for the first time. Dominion of Newfoundland had one competitor, Eric Robertson. But as the dominion had no official Olympic committee, his nationality could not be confirmed and he had to represent Britain. As the local Olympic Organizing Committee went bankrupt during the Antwerp 1920 Games, no official report of the Games was ever produced. The documents of the Games were archived at the Belgium Olympic Committee headquarters in Brussels. These are the top ten nations that won medals at the 1920 Games. ^ Renson, Roland (1996). The Games Reborn. The VIIth Olympiad Antwerp 1920. Antwerp: Pandora. p. 11. ISBN 90-5325-051-4. ^ Renson, Roland (1996). The Games Reborn. The VIIth Olympiad Antwerp 1920. Antwerp: Pandora. p. 12. ISBN 90-5325-051-4. ^ Renson, Roland (1996). The Games Reborn. The VIIth Olympiad Antwerp 1920. Antwerp: Pandora. p. 13. ISBN 90-5325-051-4. ^ Renson, Roland (1996). The Games Reborn. The VIIth Olympiad Antwerp 1920. Antwerp: Pandora. p. 14. ISBN 90-5325-051-4. ^ Renson, Roland (1996). The Games Reborn. The VIIth Olympiad Antwerp 1920. Antwerp: Pandora. pp. 15–17. ISBN 90-5325-051-4. ^ Renson, Roland (1996). The Games Reborn. The VIIth Olympiad Antwerp 1920. Antwerp: Pandora. pp. 18–19. ISBN 90-5325-051-4. ^ Renson, Roland (1996). The Games Reborn. The VIIth Olympiad Antwerp 1920. Antwerp: Pandora. pp. 20–21. ISBN 90-5325-051-4. ^ "Antwerp 1920". Olympic.org. International Olympic Committee. ^ The IOC site for the 1920 Olympic Games gives erroneous figure of 154 events, while the IOC database lists 156 ones. ^ "Football at the 1920 Antwerpen Summer Games | Olympics at Sports-Reference.com". Olympics at Sports-Reference.com. Retrieved 4 February 2018. ^ "1920 Summer Olympics cycling individual road race". Sports-reference.com. 12 August 1920. Retrieved 21 January 2012. ^ "1920 Summer Olympics cycling team road race". Sports-reference.com. 12 August 1920. Retrieved 21 January 2012. ^ "1920 Summer Olympics boxing". Sports-reference.com. Retrieved 21 January 2012. ^ "1920 Summer Olympics wrestling". Sports-reference.com. Retrieved 21 January 2012. ^ "profile of Tennis at the 1920 Summer Olympics". Sports-reference.com. Retrieved 21 January 2012. ^ a b "Shooting overview of the 1920 Summer Olympics". Sports-reference.com. Retrieved 21 January 2012. ^ "1920 Summer Olympics rowing website". Sports-reference.com. Retrieved 21 January 2012. ^ Sports-Reference.com 1920 Summer Olympics sailing mixed 12-foot results..
^ "profile of the 1920 Summer Olympics fencing events". Sports-reference.com. Retrieved 21 January 2012. ^ FIFA.com 1920 Summer Olympics ITA-EGY results. Archived 1 February 2009 at the Wayback Machine – accessed 6 October 2010. ^ "1920 Summer Olympics archery profile". Sports-reference.com. Retrieved 21 January 2012. ^ "1920 Summer Olympics athletics". Sports-reference.com. Retrieved 21 January 2012. ^ "1920 Summer Olympics equestrian". Sports-reference.com. Retrieved 21 January 2012. ^ "1920 Summer Olympics men's field hockey". Sports-reference.com. Retrieved 21 January 2012. ^ a b c "1920 Summer Olympics football". Sports-reference.com. Retrieved 21 January 2012. ^ "1920 Summer Olympics gymnastics". Sports-reference.com. Retrieved 21 January 2012. ^ "1920 Summer Olympics modern pentathlon". Sports-reference.com. Retrieved 21 January 2012. ^ "1920 Summer Olympics rugby union". Sports-reference.com. Retrieved 21 January 2012. ^ "1920 Summer Olympics tug of war". Sports-reference.com. Retrieved 21 January 2012. ^ "1920 Summer Olympics weightlifting". Sports-reference.com. 29 August 1920. Retrieved 21 January 2012. ^ "1920 Summer Olympics polo". Sports-reference.com. Retrieved 21 January 2012. ^ "1920 Summer Olympics sailing". Sports-reference.com. Retrieved 21 January 2012. ^ "profile of Figure skating at the 1920 Summer Olympics". Sports-reference.com. Retrieved 21 January 2012. ^ "profile of the men's Ice Hockey at the 1920 Summer Olympics". Sports-reference.com. Retrieved 21 January 2012. ^ "profile of Diving at the 1920 Summer Olympics". Sports-reference.com. Retrieved 21 January 2012. ^ "profile of Swimming at the 1920 Summer Olympics". Sports-reference.com. Retrieved 21 January 2012. ^ "profile of Men's water polo at the 1920 Summer Olympics". Sports-reference.com. Retrieved 21 January 2012. ^ "profile of Cycling at the 1920 Summer Olympics". Sports-reference.com. Retrieved 21 January 2012. ^ Dohey, Larry. "Newfoundlanders and Olympic Connections". Archivalmoments.ca. Archived from the original on 7 January 2015. Retrieved 7 January 2015. ^ "Olympic Games Official Report 1920" (PDF). Archived from the original (PDF) on 5 May 2011. Retrieved 23 March 2011. Wikimedia Commons has media related to 1920 Summer Olympics. "Antwerp 1920". Olympic.org. International Olympic Committee. 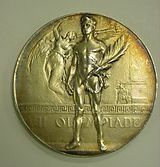 "Results and Medalists — 1920 Summer Olympics". Olympic.org. International Olympic Committee. Openingsceremonie An article about the opening ceremonies of the 1920 Antwerp Olympiade in Flemish.